Academic dress is the formal attire worn by students and officials at a commencement or graduation ceremony. The most common styles emulate the everyday clothing worn by scholars at the first universities in the eleventh and twelfth centuries. Typically, this included a flowing gown, a hood or cape, and some sort of head wear; the contemporary form of this ensemble depends on the rules dictated by the institution with which the student or official is associated. The ancient universities were established in Italy and France in the late eleventh and early twelfth centuries, with the University of Oxford following in circa 1115 and Cambridge in circa 1209. It was these two English schools that set the tradition for academic dress by establishing strict decrees for their students and officials; the subsequent influence of the British Empire spread this tradition to many parts of the world. Historically, schools of higher learning were referred to as stadium generale or universitas; titles conferred by the Pope of the day, with the latter being the higher honor. This early association with religion can still be seen in the similarities between academic dress and church robes. However, the early schools were not religious orders as a rule, but rather scholastic guilds made up of students and teachers organized around a cathedral or monastery. Not necessarily priests, the scholars wore clothes that were a sober reflection of lay fashions. In this respect, it was the degree that signified the scholar's full membership in the learned corporation, not the robe. In medieval times the term "bachelor" was used to describe the assistant of a small landowner; the apprentice as opposed to the master who was already skilled, hence the academic use of the term "master" as well. Both of these titles were in widespread use in the universities during the thirteenth century. As such, there was a structure within these institutions related specifically to the degree of knowledge obtained by the scholar. This hierarchy, along with the medieval style of clothing, became the basis of academic dress. Medieval dress consisted of a flowing gown or cappa clausa, with a cape or cloak draped over the top. This often had a cowl-like appendage that could be pulled over the head, much like a hooded cape or capitium. By the second half of the fifteenth century, the fashion had progressed toward an open gown, said to be an expression of the new acceptance of academic learning and the arts. From 1490 onward this gown became standard academic dress, with the hooded cape becoming more ornamental than practical. Most commonly, bachelors and masters scholars wore black gowns made of "princes stuff" or "crape," with the senior man's garment having wider sleeves to allow for movement while teaching. The dress hood took the form of a drooping cape, lined with silk or fur to denote the scholar's faculty or social status. For example, in 1432 Oxford forbade the use of miniver for anyone except Masters of the Arts and those of great wealth or noble birth. Variations in sleeve style and lining continued to mirror fashionable dress, and by the sixteenth century academics followed professionals and the clergy in the wearing of caps. 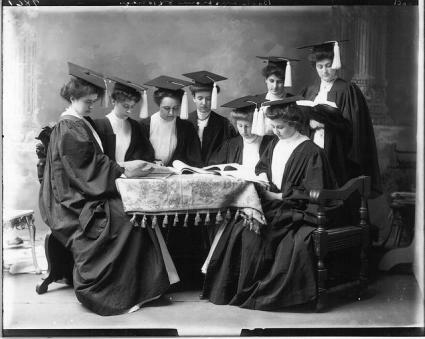 It is difficult to pinpoint the origins of the academic cap, but it is thought to have evolved as a variation on the ecclesiastic pileus cap and the medieval head scarf. Most contemporary graduates wear the trencher form of the pileus quadratus-or the Oxford mortarboard. This consists of a small skullcap, shaped to fit the head, and a flat, square top, adorned with a silk tassel. This form of headwear became popular with the clergy after the Restoration, when it was thought that emphasizing "squareness" denoted greater dedication. However, the modern academic form was not popularized until the eighteenth century, when wood or card was used to stiffen the square. Some philosophical doctors or secular doctors may wear a variation of the Tudor Bonnet, a softer, fuller hat, or if of Scottish origin, the John Knox cap. 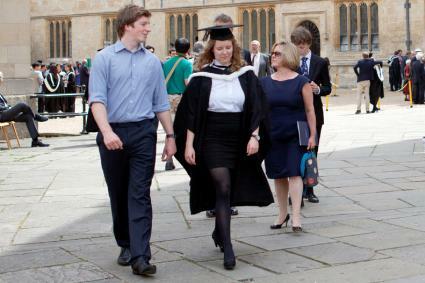 Most contemporary graduates wear a variation of the Oxford or Cambridge bachelor of arts gown. The Cambridge gown is knee-length, "princes stuff" and has pointed, open sleeves: the seam on the forearm is unsewn to the cuff, allowing a generous hole for the arm to pass through. The hood is partly lined with white fur or silk that is colored to denote the degree of the wearer. The sleeveless Oxford "commoners" gown sits a little below the knee and is expected to be worn with lay clothes that conform to a strict code. The lining of the hood is again appropriate to status. Hugh Smith's Academic Dress and Insignia of the World (1970) provides a thorough reference for those interested in all dress variations. In the United States most universities accept the Inter-Collegiate Code (1895) of academic dress, a variation on the Cambridge style, but with an extensive system of color coding that denotes both the degree and the university. In many other countries students do not wear any academic dress: in Germany, it is seen as a sign of respect for the teachings of Martin Luther; in the former Soviet Union, students receive medallions; in Finland, doctors don swords for their commencement. And in many more countries, adaptations have been made to the English model, with Native Americans adding traditional jewelry and head wear, New Zealand Maoris wearing feathered capes, and Australian Aborigines adopting red, yellow, and black capes. Certainly, the fact that academic dress pays homage to establishment and tradition makes it the perfect dress for subversion. 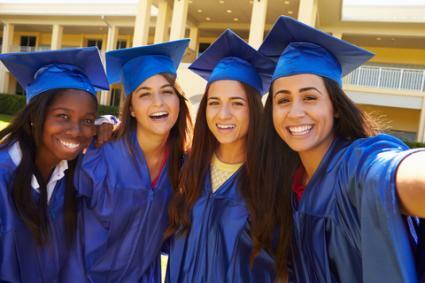 The use of the cap and gown in American high schools originated in 1911 as a means of providing an economical and egalitarian code of dress. American educators joined with the academic dress companies to design an official ensemble for the high school graduate. It was gray, with long, pointed sleeves and the Oxford mortarboard cap. One of those who pushed for such dress in schools was the principal of Englewood High, Chicago, James Armstrong. He believed that the adoption of academic dress would ease the burden on parents to provide fashionable and expensive graduation outfits. By the early 2000s, traditional gray had been replaced by the official colors of the particular school, with religious or private girls' schools opting for white, grammar schools for maroon. Across America the cap and gown has been adopted by many institutions, with even nursery schools conferring honors on their infant graduates. This practice has not been widely emulated beyond the United States; however, some schools in Australia and Asia have adopted the practice. As a means of historical record, academic dress encapsulates medieval fashion, preserving its character and form for what is an important modern occasion, both to the graduates and to those who have carried them through their time as a scholar. Hence, this form of dress is both steeped in tradition and very distinct from everyday clothes-such contrast clearly conveys significant achievement. Goff, Philip. University of London Academic Dress. London: University of London, 1999. Smith, Hugh. Academic Dress and Insignia of the World. 3 vols. Cape Town, South Africa: Balkema, 1970. Walters, Helen. The Story of Caps and Gowns. Chicago and New York: E. R. Moore Publishing Company, 1939. Cox, Noel. "Academic Dress in New Zealand." Auckland: Private Monograph. Previously available from http://www.geocities.com/noelcox/Introduction.htm.